but I have failed to do so, I do apologies. I just started out a new job and managing many other things at the same time. where I get a lanyard with the access card attached for the first time. Really can't stop finding an excuse to use it. 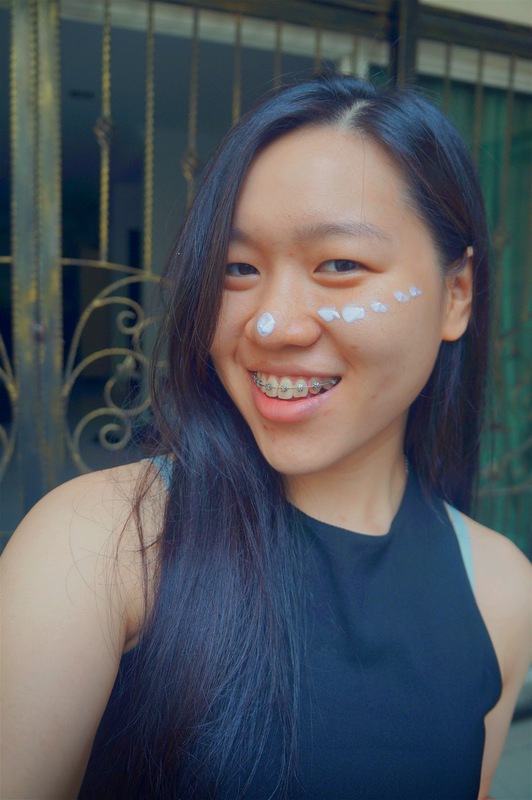 Today, I want to talk about having fair skin. flawless fair skin like those Korean actresses. getting injections to lighten skin tone. So, what can you do??? 1. Increase your Vitamin C intake! it will help increase your skin's color and suppleness. Besides that, it helps with the prevention of saggy skin and wrinkles. especially from citrus fruits like oranges, lemons. that is like 5 serving of fruits and vegetables. 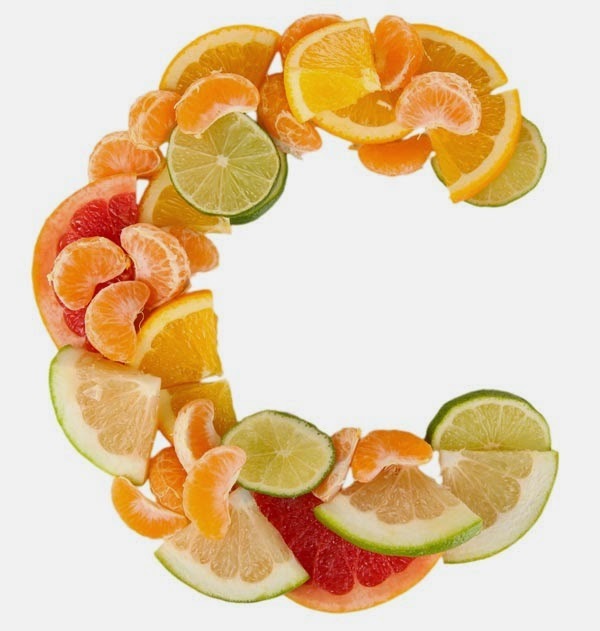 taking a Vitamin C supplement is a good alternative. 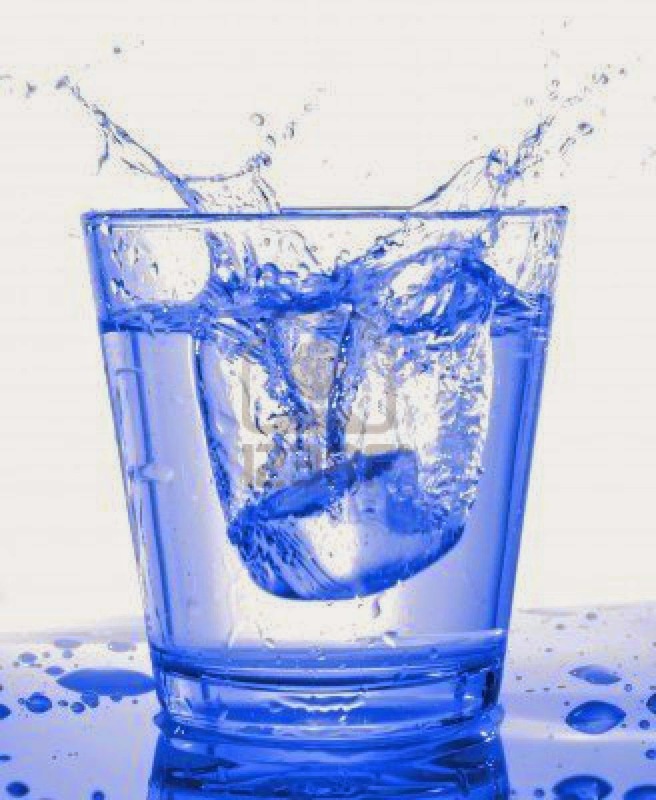 We all know that majority of our body is made of water. So, we must drink enough water to main it's hydration and not dry out. It will help with the renewal of your skin. I think everyone knows that having a healthy diet is key in having a healthy body. nutrients to allow it to repair itself. This means that our skin will become much nicer as our diet changes. stay away from processed, high-calorie foods. good and potentially fairer complexion. however, is our bare skin equip to defend against all the harm it faces everyday? That is why it is important to invest in a good sun block/day cream. 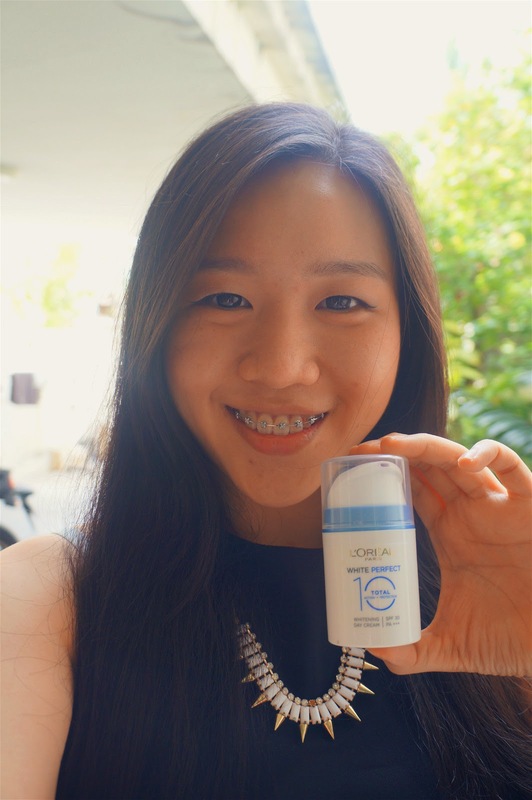 L'Oreal is launching a brand new Whitening Day Cream! it also help with whitening if our skin! whitening day cream before the product launches for the public. 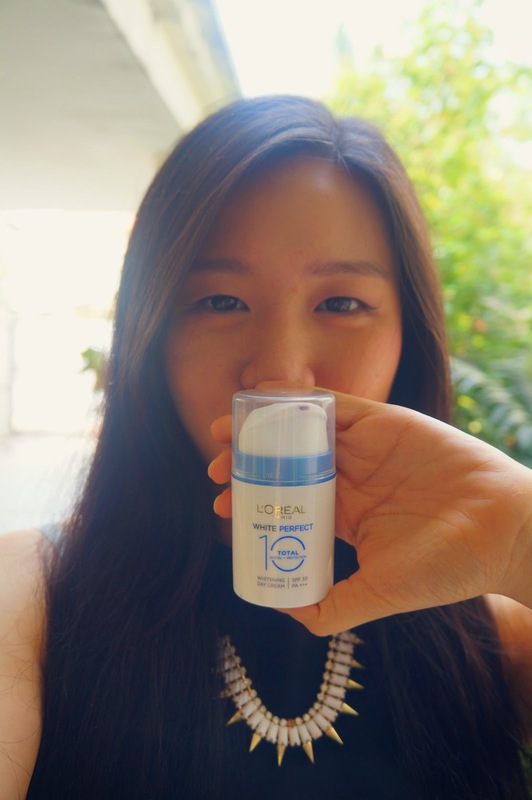 you will know that I am quite picky when it comes to sunblock/day cream. 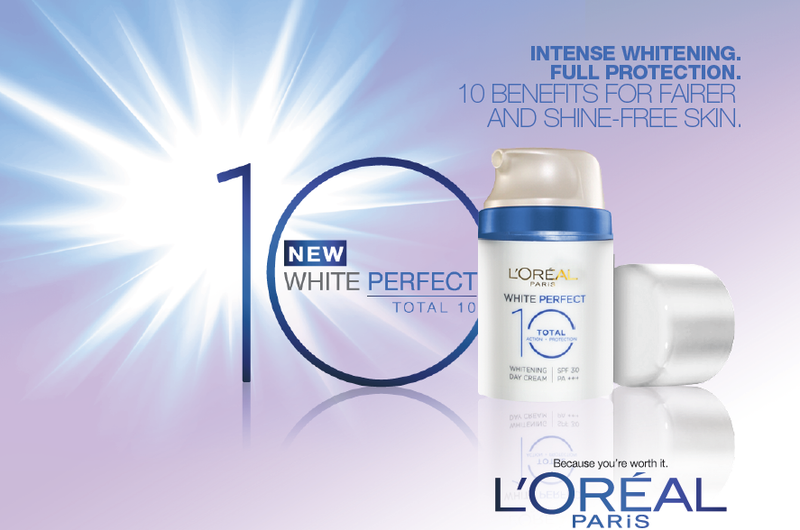 So, how was L'Oreal's latest White Perfect 10? 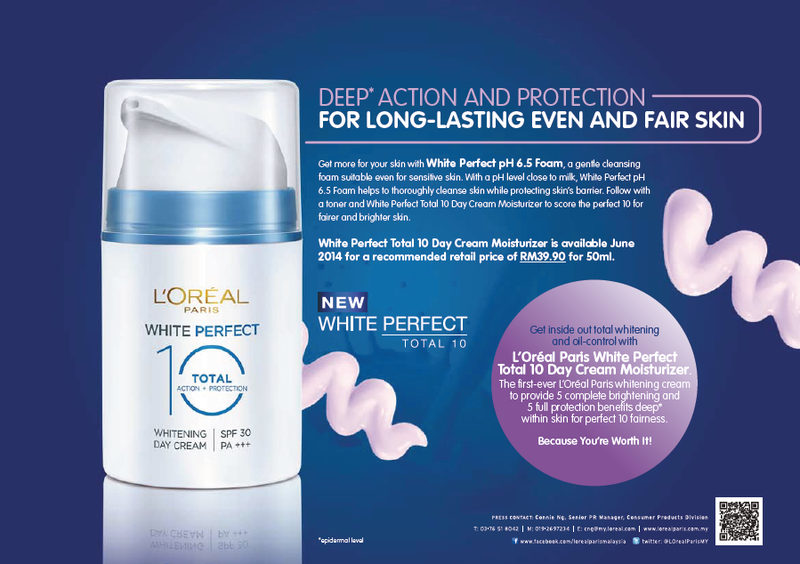 For the first-time ever from L’Oréal Paris, a whitening cream that not only gives you fairer skin but protects from external aggressions to help prevent future UV-induced darkening and excess sebum. 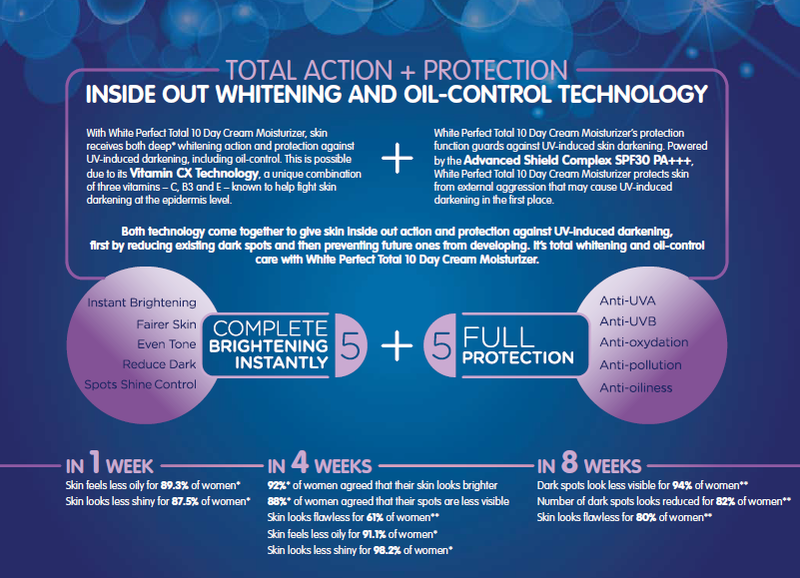 Great skin is easy to achieve with just one product packed with 10 multi-action whitening and oil-control benefits! It is a great day cream. Oh the smell is so so good! which is a lovely color. The right half of my hand is noticeably fairer than the left after application. it also has 10 wonderful benefits all packed into a lovely bottle. 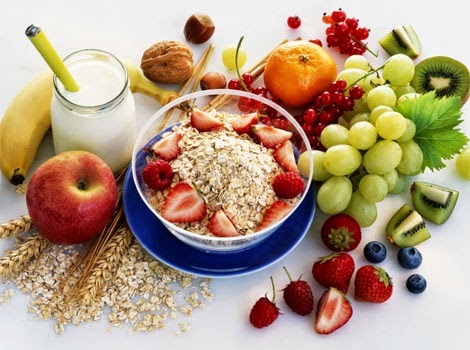 10 awesome benefits that comes packed altogether! This is just perfect for us girls who are always busy and on the move. We can now do it with White Perfect 10! Here are the benefits that this day cream can bring to us! I feel so excited the more I use this product. Want to get yourself a FREE sample this awesome all in one day cream? 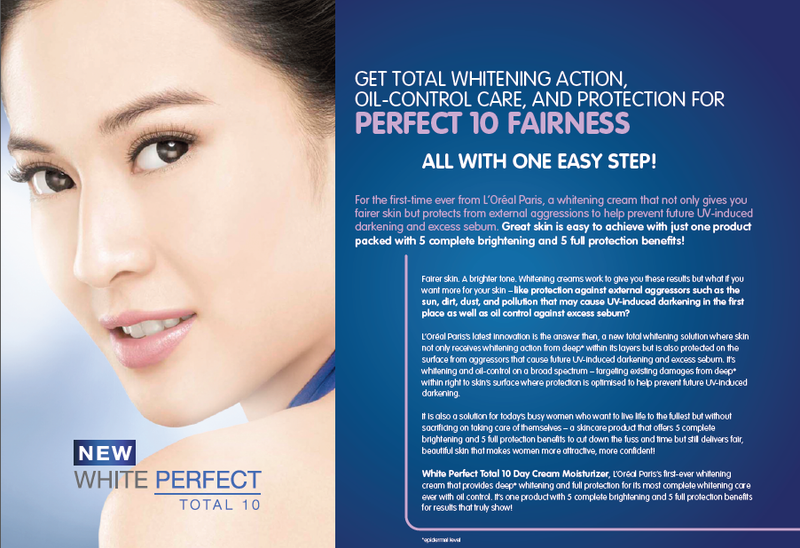 Visit White Perfect Total 10 website to get stand a chance to get yourself one! If you’re serious about whitening your skin, you’d be crazy to at least not consider using natural methods. 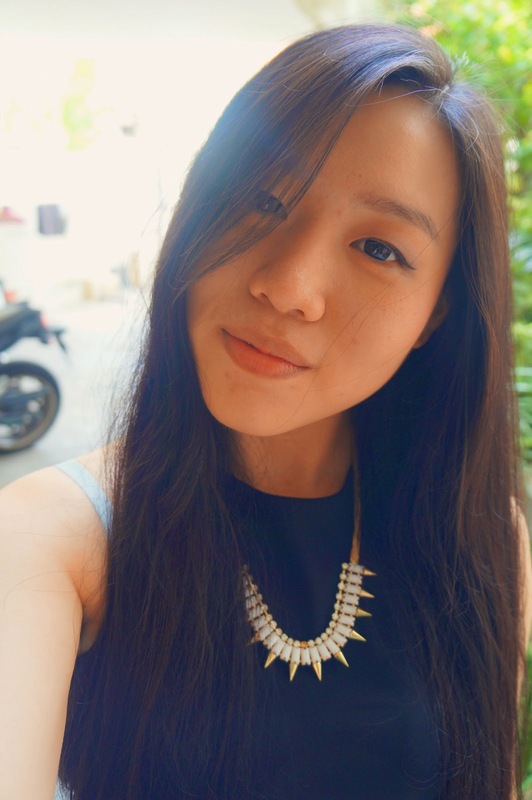 You see… using commercial skin whitening products is dangerous. They come with side effects and health risks. And some of the symptoms are quite serious too. She bought the skin-whitening product that her dermatologist recommended. To her delight, she started seeing results quickly. But the joy soon turned to despair, when she noticed her skin wasextremely dry, tight and leathery. Patchy spots then started to break out and becamelarger and larger. And she alsohad severe skin pigmentation. All in all… she was devastated. But instead of giving up… she started to do a lot of research online. Eventually she managed to discover some very rare(and 100% NATURAL) skin-whitening methods. So she gave them a try... and they WORKED like a charm… without any side effects. Bottom line… these remedies are guaranteed to work… or your money back.